Easter is on it’s way (April 5) and we are well on our way to creating a huge assortment of very unique Easter chocolates! We make all of our chocolate molds in Milk, Dark or White chocolate (some are in very limited quantities) if you have a special request please don’t hesitate call and chat with Valerie. I have included a few pictures and a short description of some of the chocolates that we are making this year. We have so many different things that it would be impossible for me to list each of them, and truth be told, I would MUCH RATHER be making chocolate right now, than taking pictures and writing up descriptions, but, it must be done! You can click on the slideshow of pictures above or click here to view our Easter items. Today, we made some dinosaur eggs. They are so cool looking! White chocolate lightly dusted with cocoa (to look like dirt, of course!) and filled with gummy dinosaurs! As soon as I can get away from this desk, I’ll be making a version of this egg for girls, they are all $4.99 each and you may want to stop by and get yours while they last! Raspberry truffle egg – You know that this is one of our favorite truffles, why not make yourself an Easter basket as well!!! Easter baskets- in all sizes and price ranges….let the speckled hen put one together for you! Huge (3′ tall) Easter bunnies with toys inside! No need for a basket….break this bunny open and lets the games begin!! 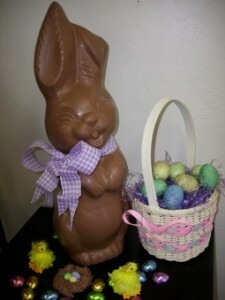 Would you like the chance to win your very own 3 foot tall Easter bunny? You have 2 options! 1. Stop by the Speckled hen Retail store at 656 Saxonburg blvd and purchase something…anything, or give us a really nice comment and a smile and you can enter to win this big bunny for free! 2. Stop by Bogacz Country Market (the gas station/convenience store) located just up the street from us. For a small donation (100% of which goes to Make-A-Wish) you can enter to win one of two huge bunnies filled with boy toys or girl toys. You can enter to win them both!! * nice comments and smiles are appreciated here too!! Extended hours for Easter~Starting in April, we will have extended hours…check back or give us a call for more details….. Happy Spring!!! And Hoppy Easter!! !